Donna Spitzer and her Jazz group brings to audiences a stellar lineup of accomplished local musicians, brilliant vocal stylings and a rich repertoire of tasteful Jazz, Blues, Swing and eclectic originally arranged Pop favorites. In clubs, restaurants and cabarets as a duo, trio or larger, this group pleases listeners with fresh and unusual tunes as well as warmly familiar, though originally executed, material. Donna’s voice has been described as “sultry and warm”, “brilliant and alive, her stage presence warm and inviting. 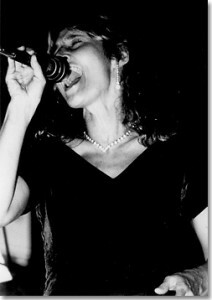 Donna’s singing career is a natural outcome of a life-long involvement in the performing arts. She was a member of experimental theatre groups and danced with a small company in her native New York. Donna began singing in San Francisco as a founding member of Full Swing, a Vocal Jazz Quartet. She’s sung with the Oakland Interfaith Gospel Choir, with a 20 piece Big Band, and in numerous Jazz combos under her artistic direction.